The city of Fresno, California, is a sprawling place, not known for having a strong transit system. But it’s been making big strides. Last year, this city of 500,000 passed a “general plan” that called for 45 percent of new development to be “infill,” or built in already developed areas. The plan relies on beefing up transit service as well. The proposal the city settled on calls for two bus rapid transit lines — one running north-south and the other running east-west. About 60,000 people make their homes within a quarter mile of the proposed routes. Fresno was able to win some $50 million to make it happen, as well, thanks to a federal Small Starts grant and state environmental grants. The city’s major real estate developers, however, never liked the proposal to limit sprawl, and now they’re threatening to derail BRT and the general plan. Those plans — representing almost $60 million in spending — are on the line in a City Council vote tomorrow. Will local officials vote to proceed with the BRT proposal, as required by state law? Christine Baker is a coordinator with a group called FLARE Together — Fresno Leaders Advocating Regionally for Equity. She said city government could go either way. In their opposition campaign, local real estate developers have teamed up with the Tea Party and the Amalgamated Transit Union, whose local leader is allied with Tea Party groups, Baker said. “We have a local PAC that has been running fear mongering ads on local conservative talk radio: ‘If BRT is approved crime will increase in Riverpark,'” a shopping center. If the city refuses to support BRT, it will lose the $50 million in funding — which included three years of operating money — as well as some $7 million that was spent developing the general plan. Plus, it will cost millions to develop a new plan. 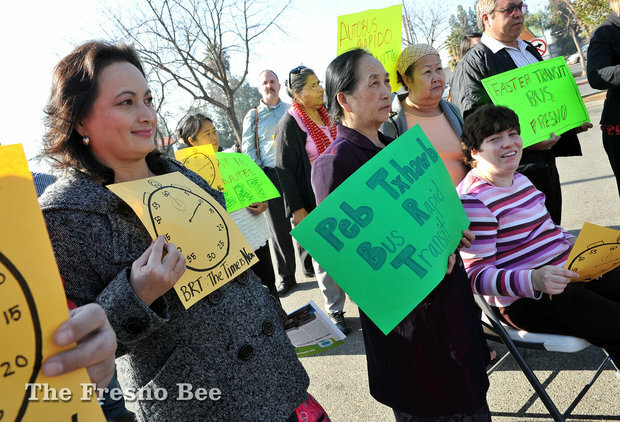 Opponents of the plan have suggested the money would be better spent improving existing bus routes. But federal guidelines wouldn’t allow the money to be transferred that way. Furthermore, as the Frenso Bee pointed out in an editorial today, the city was required to show that the bus rapid transit lines would be financially viable in the long term in order to qualify for federal funding. So there’s no sound reason to worry that other bus service would suffer. How odd to think the transit union would be arguing against more transit. I grew up in Fresno. Fresno has always been run by the developers, which is why the downtown has rotted and its only significant high-rise has sat mostly empty for most of my lifetime and why most of the southern portion of the city has staggering rates of poverty. This constant resistance toward anything that resembles smart urban planning has only made Fresno less livable as it has become more and more populous. Keep in mind that Fresno is also very much at the center of the anti-High Speed Rail movement…this attitude is holding the entire state back now. What is this Amalgamated Transit Union, and what relation does it have to a labor union for transit workers? Also, it seems like there should be able to be an alliance with some sort of property developers in favor of infill and transit. Although some developers have special talents for clearing open space and turning it into tract housing, others specialize in reconstructing denser infill development. Those developers would presumably support these sorts of plans in order to grow their market. The Amalgamated Transit Union is a genuine labor organization, dating back to 1892. As one might guess, it started out organizing street railway workers, and, as buses started to take over the transit industry, bus drivers. According to Wikipedia, it has about 190,000 members. There are no infill developers in Fresno. Good grief. That’s not a good thing. Poor transit workers, having had their union taken over by a quisling. Eight years in the making, the project was undone by suburban opposition. Now, transit advocates in Michigan's capital are figuring out what can be done to improve transit while their opponents take a victory lap.